Posted on June 15, 2015 at 9:57 am. G’Day Casino, a licensed and regulated online and mobile gambling website specifically designed for Australians, is one of the better casinos in terms of consistent promotions and bonuses. 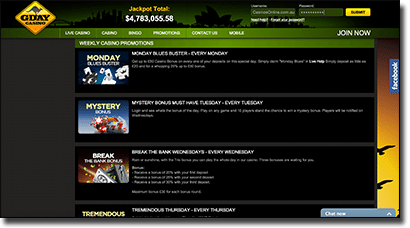 In addition to its list of hundreds of AUD interactive pokies, blackjack, roulette, baccarat, poker and other casino games, the team at G’day has devised a list of promotions for each day throughout the week, so players will never miss out on the chance to score some extra bonus cash, free spins and prizes. Monday – Each Money, members can grab up to $50 in casino bonuses with a 25 per cent matched deposit promotion. In the ‘Live Help’ section of the casino interface, enter “Monday Blues” and upon you deposit, you’ll be granted a 25 per cent bonus. Do this as many times as you wish. Tuesday – The mystery bonus day. G’day will hand out 10 mystery prizes to 10 lucky players who log in on Tuesday and play any real money game. Players are notified if they win on the following day. Wednesday – Enjoy a trio of deposit cash bonuses on Wednesday. Receive a 20 per cent cash injection bonus on your first deposit of the day, a 25 per cent cash bonus on your second deposit, and a 30 per cent booster on your third deposit of the day. Thursday – Keep and eye out for the slots game of the day – you will be notified via email. Whatever the game is, all players will be eligible for double loyalty points when playing the chosen title for real money. Friday, Saturday and Sunday – Every weekend, G’day is handing out a host of prizes and bonuses, including free spins, loyalty points, cash, and more, in its Dish of the Day promotion. All you have to do is check your email for G’day’s weekly newsletter at the end of the work week, and follow the instructions which will inform you exactly how to claim your prize. Do so, and your prize will be instantly credited to your casino account. Simple. But G’day Casino doesn’t stop there. On top of its daily promos and bonuses, it also promotes its very own Facebook Draw, where registered casino members can win $50. Make sure you have ‘liked’ the G’day Casino Facebook page, and simply check that page each Wednesday night to see if you’re the lucky winner. The draw is conducted before midday on the Wednesday, and in order to be eligible to win the draw, you’ll need to have made one real money deposit since opening your account. New and experienced players are also eligible for a 10 per cent bonus up to $50 on each and every deposit they make (after receiving the initial welcome package, which is a bonus of up to $1200 over three deposits, along with 50 free South Park Reel Chaos spins and a slab of beer sent to your residential address). Live support staff are available 24/7 to help you out with any queries you may have, so feel free to get in touch with the helpful team at G’Day Casino, and enjoy the online gaming experience.